“You came into my life and changed everything... forever. 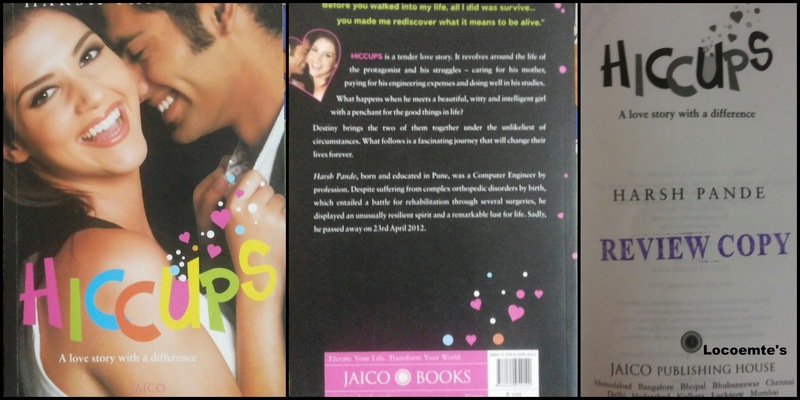 HICCUPS is a tender love story that leaves you with a happy feeling. The story revolves around the life of the protagonist, how he struggles through life as a student taking care of his mother; paying for his engineering expenses with scholarships and awards. Enclosed in a wall of priorities doing well in his studies was paramount to him. What transpires when he meets a beautiful, witty and intelligent girl with a penchant for the good things in life? Destiny brings the two of them together under the unlikeliest of circumstances. What follows is a fascinating journey that will change their lives forever. Harsh Pande was born and brought up in the amazing city of Pune. Harsh displayed exceptionally admirable spirit and intelligence which helped him achieve excellent results in academics and other endeavors, despite suffering from complicated orthopedic disorder by birth which entailed a separate battle for rehabilitation through several surgeries. However, his resilient spirit and lust for life were indefatigable. She is bright, beautiful and intelligent. She is like any other teenager who takes life as it comes. She is also friendly, caring and understanding. The book blurb is really interesting and so is the title. They will definitely grab a potential reader’s attention. The font and line spacing is perfect making the reading a less cumbersome process. The plot is very different and carries a high-level of optimism. Each page and line oozes with positive vibes which also transmits into the reader. The way in which the story unravel is also very unique with very different elements like quizzes and difficult past. The narrative is simple and lucid. There are many quirky dialogs; some are funny and some are philosophical. Tiny poems in the book adds to the charm and makes us delve deep into his mind and thought process. Another interesting and unique aspect is that the lead characters are always address as HE and SHE. Their names are not reveals till the end. This lets the reader think of suitable names to them. It enables the readers to use their wings of imagination. The story takes place in a time where pubs culture is at its high and dating is an accepted routine affair. But, the beauty is, in spite of the freedom the HE and SHE enjoy, they know their limits. Their characters are well-developed; especially HIS. In short, the book is different love story – far different from the several clichéd ones. The cover page is average. It lacks creativity and in fact, doesn’t really blend with the story. Yes, the story flows with minimal hiccups like a breeze of fresh air. I heartily thank Jaico Puiblishing House for giving away the book for review. You have touched all the aspects needed for a reader.